Ferrari CEO Sergio Marchionne announced last September that the Italian automaker was building a 500th example of the Ferrari LaFerrari that would eventually be auctioned off to benefit the victims of the massive earthquake that devastated Central Italy. No details were given then on the when and where of the auction, but now, the information’s out. The 500th and last production Ferrari LaFerrari will auctioned off by RM Sotheby’s on December 3 during the Ferrari Finali Mondialia event at the Daytona International Speedway in Daytona Beach, Florida. The event is being organized by the auction house, in partnership with the National Italian American Foundation’s Earthquake Relief Fund. Is now the time to remind all of you to prepare those checkbooks? I can’t be certain, but seeing as this particular LaFerrari will go down in Ferrari history as the “LaFerrari that wasn’t supposed to exist,” it’s going to fetch a lot of money from collectors looking to score one of the most famous LaFerraris in the model’s entire lineup. In addition to being the fastest and most powerful Ferrari in history, the LaFerrari is historic for a number of other reasons, not the least of which is its status as the first Ferrari to utilize a hybrid powertrain. That status is afforded to all 500 LaFerraris, but only one can lay claim to not being part of the automaker’s planned first production run. That one Ferrari LaFerrari will go under the hammer this Saturday in Daytona Beach, Florida. 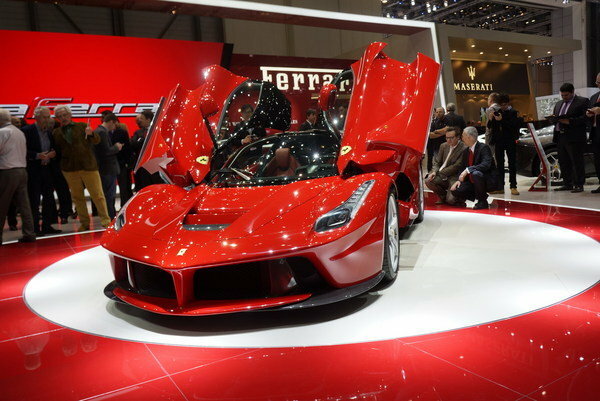 Here’s what I do know: don’t expect this LaFerrari to be sold for the price of any of the “standard” models. Nope. $1.3 million may have gotten you any of the 499 LaFerrari models before it, but seeing as this is the 500th production model, don’t expect it to fetch for anything less than $2 million, and that may even be a conservative estimate. If there was ever a car that deserves to be auctioned off at a staggering price tag, the 500th production is it. Not that it’s going to need any more hype than it already has because the mere fact that Ferrari was never supposed to build this LaFerrari already speaks to its status as a true collector’s item. The good news is that interested bidders won’t even have to be physically present at the auction to flex their checkbooks. Remote bidding options like telephone and absentee bidding will be accepted so if even if you’re not there, you’ve got a shot at winning this supercar, provided of course that your wallet can take it. And for what it’s worth, Ferrari saw to it that the 500th LaFerrari will be a true one-off. It’s got unique details that no other LaFerrari will have, including the Italian tri-color flag on its nose and a cabin that pays homage to its home country to go with specialized details and a special plaque that denotes the model’s unique status as the one, true 500th LaFerrari. Given these details and the all-too important fact that all the proceeds of the auction will be sent to benefit the victims of the earthquake in Central Italy last September, I’m hoping and expecting that the price of the 500th LaFerrari will go through the roof. It’s only fitting that it does given that all the proceeds will go to people who need them the most. Comments Off on LaFerrari now listed on carsales at an eye-watering price! LaFerrari now listed on carsales at an eye-watering price!